GOODMAN LUMBER, San Francisco CA: Goodman Lumber was a longstanding independent hardware and building supply store in San Francisco. It was located down on Bayshore Blvd. just off the 101 and served the needs of the people of San Francisco for 51 years. Charlie Goodman’s father Edward Goodman started the store and Charlie ran it for many years. They employed about 150 people in the local area. Unfortunately Charlie and his father had a falling out and when Edward died, he left the land on the site where Goodman Lumber sat to his sister Joan Goodman Zimmerman. Joan Goodman Zimmerman leased the land to Charlie Goodman on a year to year lease. Then, reportedly, Joan wanted Charlie to make a number of improvements to the property but, according to Charlie, would not give him a long-term lease to protect his investment in the property. Rather than make the improvements a decision was made in 2000 to shut Bayshore Blvd’s Goodman Lumber down. After a few years Home Depot decided to try and take over the location where Goodman Lumber sits vacant today. But San Francisco is not necessarily a friendly place for big box retailers and despite hearings on this project before the San Francisco Board of Supervisors, today, seven years after they closed Goodman Lumber sits vacant and closed down. You can read more about this family feud here. Local residents complain of the blight in the area and the crime. And there are both political proponents for and against the Home Depot project. The last thing I read about the Home Depot project was in the Chronicle in November of 2005 when it seemed like Home Depot and their lobbyists were having a hard time getting their store approved. 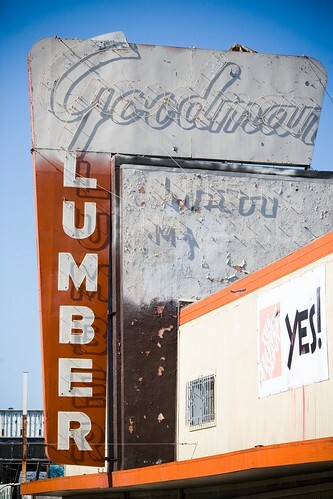 The Goodman Lumber sign is one of the grand old San Francisco neons. I particularly love the way that the neon casts a shadow on the sign in the afternoon sun.